If you’re a fan of anything, you probably have a favorite. Favorite basketball player, favorite show of your favorite TV series, favorite movie… you get the idea. With music, the question inevitably gets asked: “who is your favorite band?”, and I’m one of those that comes back with “what genre?” because there’s literally no way I can pick a favorite band. I just can’t. But if someone asks me my favorite jazz tune? That’s easy. Here it is. How can you not smile when you hear that tune? How can you not hear Charles Mingus’ exuberance? If I’m feeling down, that song will pick me up. It doesn’t hurt that Mingus Ah Um was the first jazz album Doug played for me when we started dating - he brought it to my house, handed me the CD, and said “now, turn it up really loud”. That was five years before we opened Take Five Coffee + Bar, and it undoubtedly informed my developing taste in jazz, because I’m still drawn to songs with that raw emotion on display. 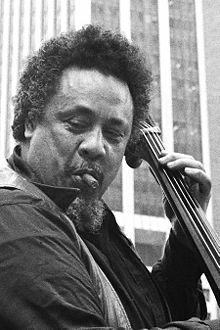 Charles Mingus was a titan, but he doesn’t often get mentioned alongside the others - Coltrane, Davis, Parker - unless you happen to be a bass player yourself. He released 51 albums as a bandleader, played on numerous other albums as a sideman and was a prolific composer. His first love was cello, but there weren’t career opportunities for African American people in symphonies in the 1930s. He was also a very accomplished pianist. Even after he was diagnosed with ALS and the disease took his ability to write, he sung his compositions into a tape recorder for others to take down. Ironically, if you ask me what my favorite song is in any other genre, I probably can’t name just one. I don’t know how Doug came to select that album, with that opening song, as the thing to bring to my house that day not long after we started dating - but I’m really glad he did. Who are your favorites? Do you know their stories, too? Share them with us, and we’ll collect some of our favorites into a guest blog post! Travel on over to the contact tab, or email me directly at lori@take5kc.com.